Be forewarned. This chapter is all UGA. 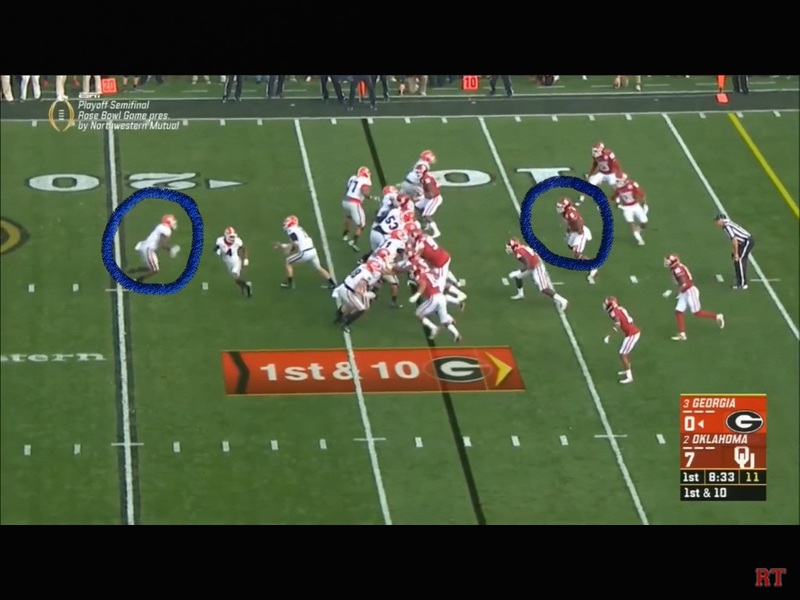 Right before the snap, Will Johnson is coming up on a run blitz. Kudos to him because he did his homework, and is flying up outside to blow up this play. The bad news is that he’s playing against a well coached team and the receiver sees him coming up hard. That receiver takes him completely off his feet and cuts off the blitz. Man that was a great block. As the guys see the toss, they have to start flying. Obo, who is the 10 o clock arrow can’t get hooked…well he gets pancaked. Beal, at this point has to be at the tip of the long middle arrow blowing this thing up. He has to fly up and force the issue. 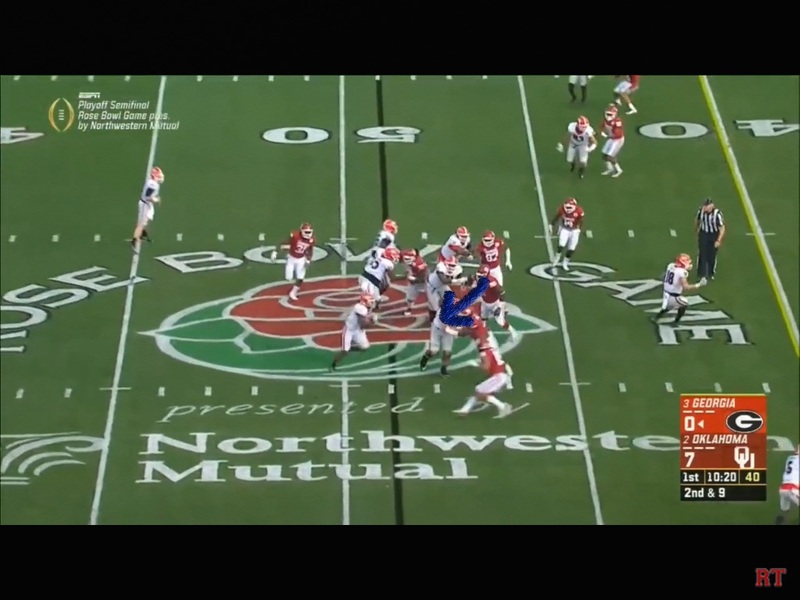 Norwood who is the corner at the 29, has to start flying up to blow this thing up as well, and with Kelly, he is the trail player waiting for someone to force the cutback to him. 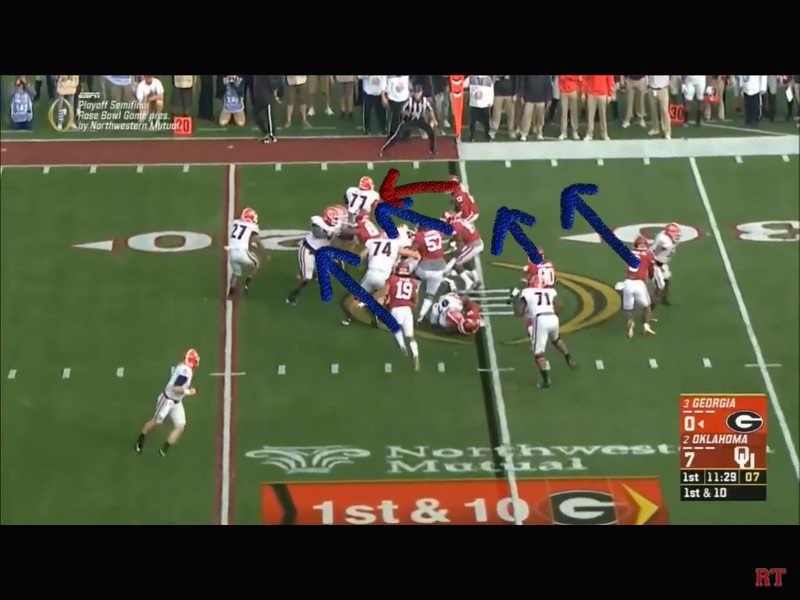 So if Beal and Norwood are playing more aggressive and are at the tips of the red arrow and top blue arrow, then I believe that Beal forces Chubb to redirect. That would give Kelly time to get there and crush him on the cutback. Gallimore and Murray need to get on their horses and get over there right now. You can see Will Johnson getting crushed on the CFP logo. And then it’s off to the races. 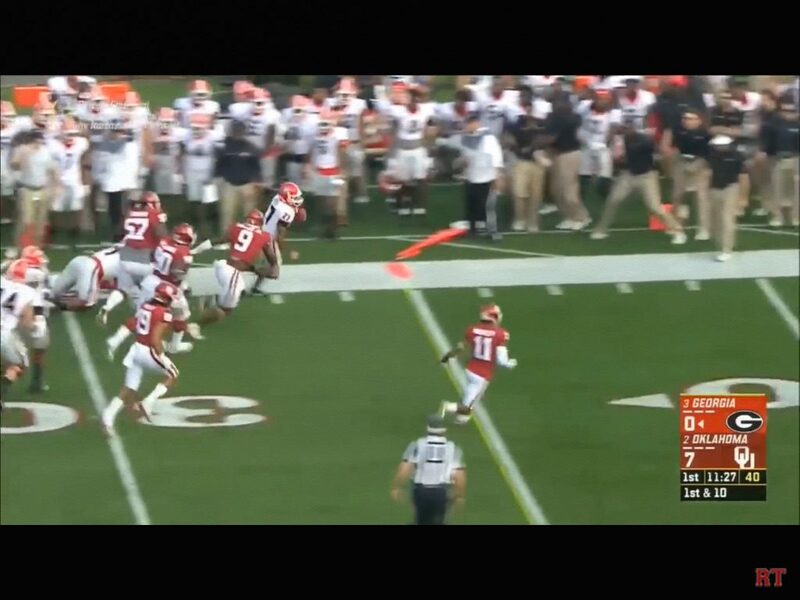 Obo and Johnson can’t get pancaked, and even still, this is a basic toss sweep. Georgia wasn’t exotic. They were just really physical, and the guys had to be gap sound along with being more aggressive. They weren’t on this play. This is Gallimore’s play. As Michel puts his foot in the ground, Neville has beaten his block on the zone play. 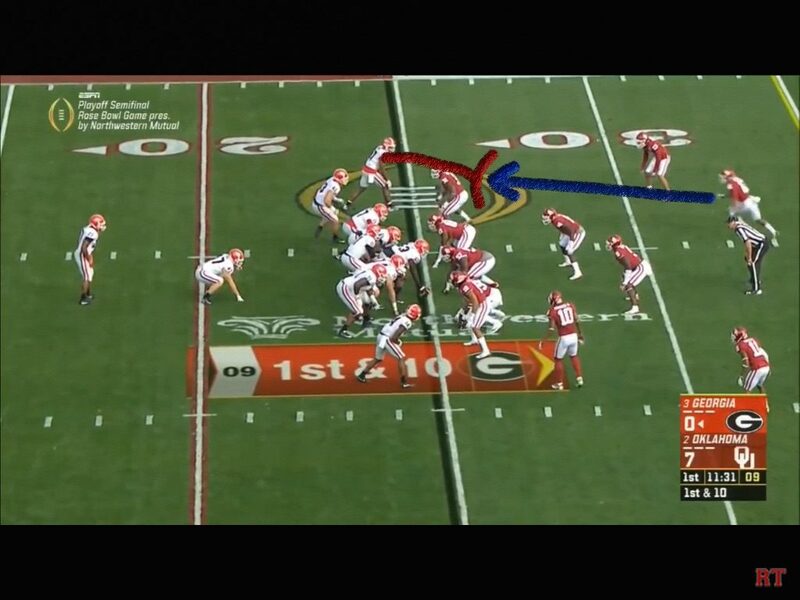 He has to be pressing that hole harder, and at the tip of the arrow, Murray has to hit that blocker harder and not “catch” his block. He has to blow it up. Neither of those things happen and it’s another long gainer. To Mike’s credit he brought more people earlier than he normally does. 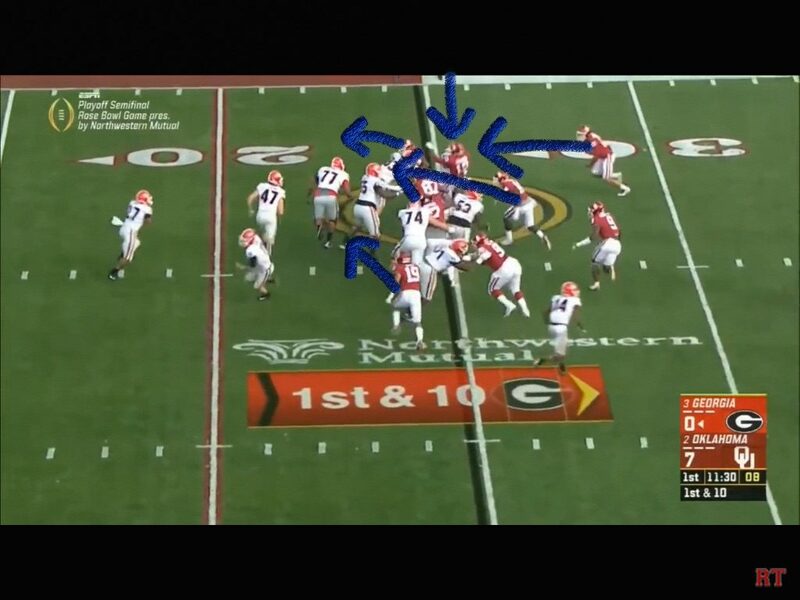 He brought 5 rushers, but Georgia kept 6 in to block. Still, there’s only one double team, and one of the four guys with one on one matchups have to win those blocks. None of them do. Kelly does a good job in coverage limiting this to a 4-5 yard gain. 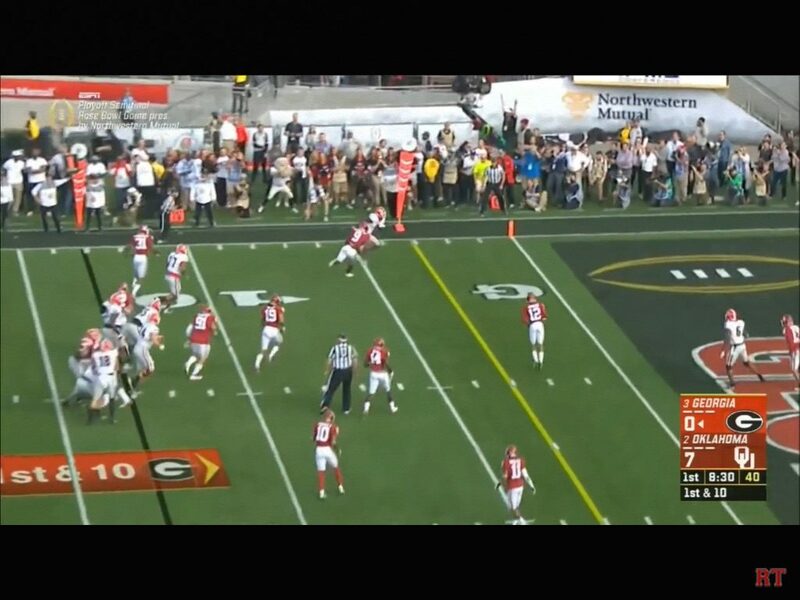 Murray was lucky he didn’t get called for targeting early here as well when he came in to finish Blazevich off. Murray has Michel in man coverage. 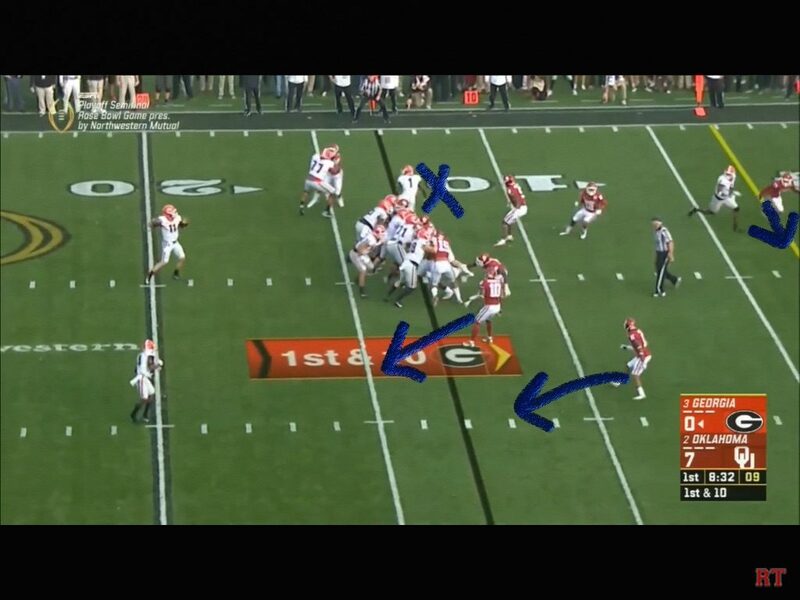 So as Fromm turns to fake to Michel, he has to A, be blowing up Michel as a ballcarrier in the hole, or B, cover him when he comes out for a pass. Fromm’s primary read is the post, which Norwood has covered nicely. 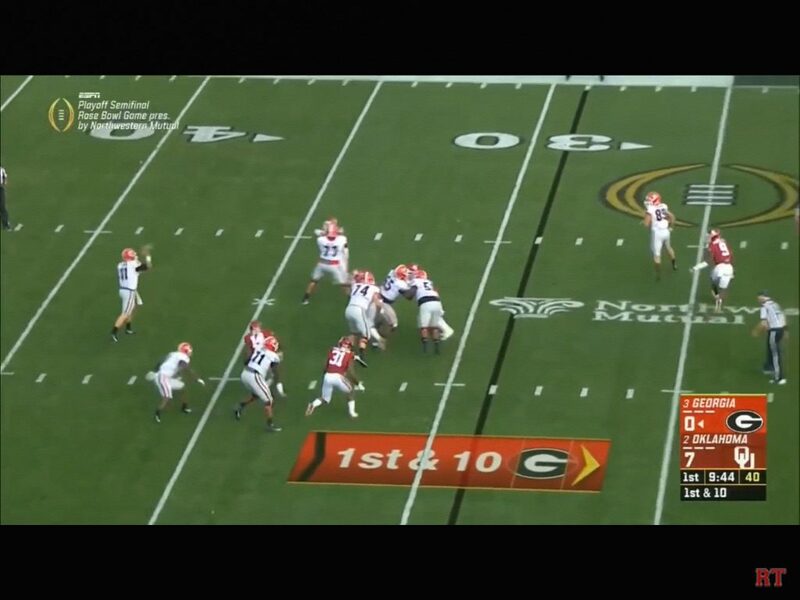 Fromm is cocked and ready to throw, but he makes a good decision by not going to the post. Motley and Parker have Hardman accounted for on the swing. The Blue X is where Murray should be on this. He has to be up there knocking Michel on his tail. 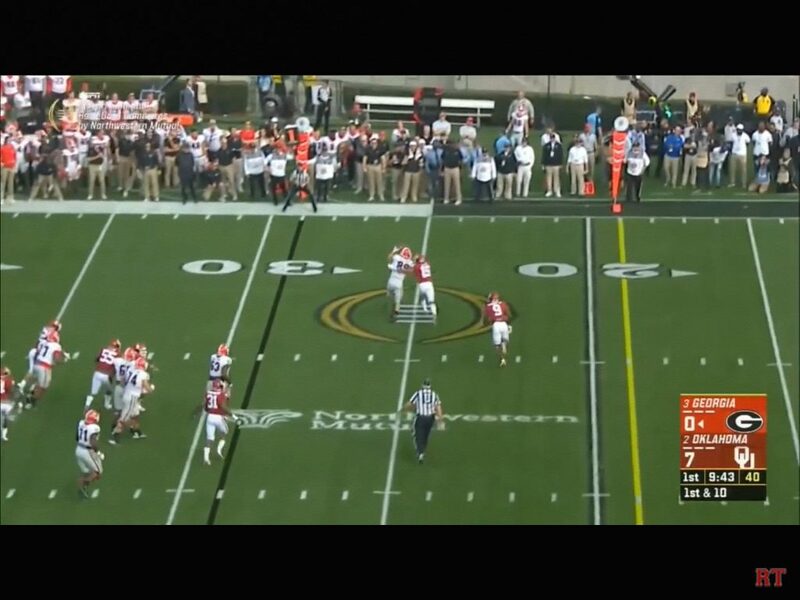 Since he had the ball faked to him, Murray could have tackled him right here and it’s completely legal. But that didn’t happen, and the split second of indecision causes the check down to come fully open. To this point in the game, Murray looked lost. By game 14 this shouldn’t happen.